I cannot believe Thanksgiving is this week! Wasn't it just yesterday that we were talking about summer and sand? Now the leaves are on the ground, there's a chill in the air, and twinkle lights have been spotted around the neighborhood. For most of us, that also means the arrival of a bunch of hungry family and friends and the opportunity to pull off another fabulous holiday meal. 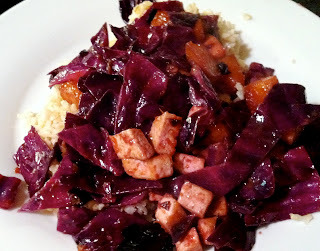 I'm talking about Stir-Fried Tofu, Red Cabbage and Winter Squash, courtesy of The New York Times. 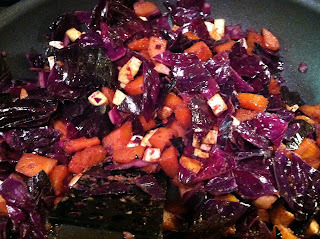 It was the suggested recipe in my Thanksgiving CSA box, which of course included red cabbage and butternut squash. It's delicious and will look lovely on your beautifully set table--the orange and purple combination is so festive! It's also healthy, which means you can load up on this side and not fill so guilty about that second piece of pie. And, this dish is pretty easy to make, so you can spend more time with your guests outside of the kitchen. 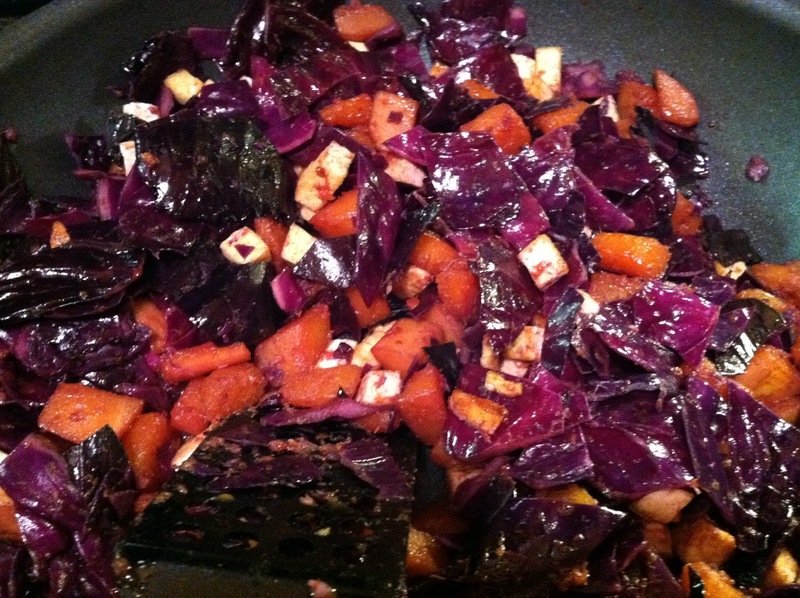 All you need to do is stir fry your tofu until browned and set with a sprinkling of soy sauce. 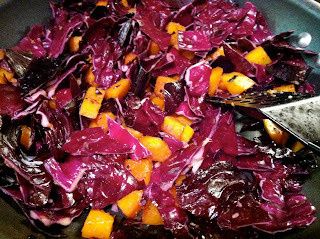 Then, you stir fry diced butternut squash with garlic and ginger then add in some coarsely chopped red cabbage, and cook until tender. Near the end, you return the tofu to the pan and then stir in a lovely sauce of soy sauce, rice wine vinegar, sesame oil, honey and corn starch until coated. Voila tres bien! When I made this, I had diced firm tofu in the fridge, so I used it instead of the slices, which was fine. I felt the sauce was a bit too quiet, so I added some garlic powder and a bit more sesame oil, honey and rice wine vinegar to the pan. It might be smart to double the recipe for the sauce and then stir it in a little at a time as you go. You don't have to use it all, but it makes it easier to adjust the seasonings if you already have more sauce ready to go. 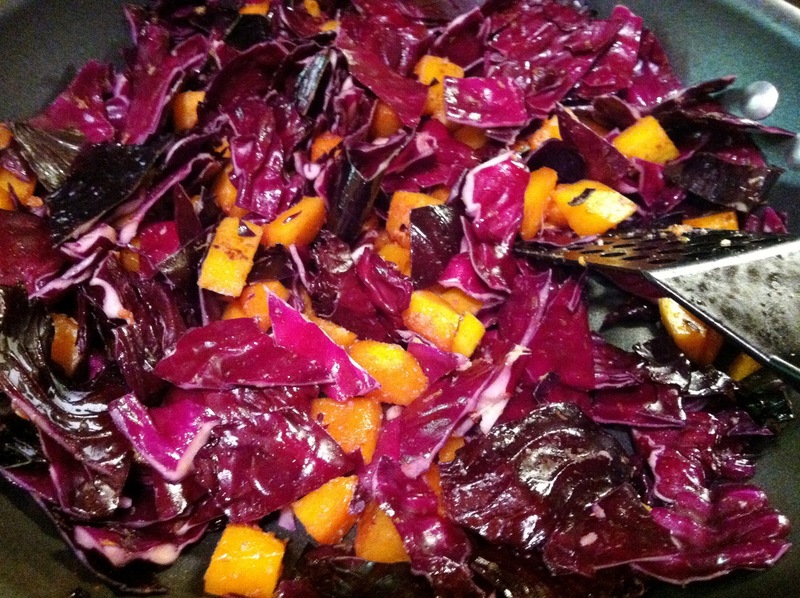 To use as a Thanksgiving side dish, you can either plate as is, or stir in a bit of cooked barley or brown rice at the end. You can omit the tofu if you want, but it adds texture and flavor to the dish that's hard to replace with another protein, so don't use anything else in the tofu's place (like chicken or shrimp). If you decide to make this again for Christmas or New Year's, change it up a bit. Keep the ginger and garlic, but swap out the sesame oil, rice wine vinegar, and soy for a fragrant orange infused olive oil, some red wine vinegar and a sprinkle of nutmeg -- and try maple syrup instead of honey. To serve as a main course, place a mound of cooked barley, wheat berries, buckwheat noodles or brown rice in the middle of each plate and top with the cabbage/tofu/squash mixture. Sprinkle with toasted sesame seeds if you're feeling fancy. P.S. If you're looking for a stunning dessert, try one of these: Apple-Pear-Cranberry Pie with Pecan Crumble or Apple Pie Cookies. My wife is exactly looking for a recipe that she can cook for our thanks giving tomorrow. I think this one is perfect. I will now show this to her. Great, Bobby! Let me know how it turns out! Have a nice holiday! great review! Thank you so much for sharing this post, cookies, your journey through Irene with us!! I feel so lucky that we were not affected in any way besides with strong winds & lots of rain! I hope that everything is back on track now!!! It's fantastic, isn't it? A favorite dish for the holidays, too, for sure.